Two Identical, separate channels, pH Controller & Float-Switch compatibility. Large red LED display, internal battery backup, compact size, quiet, dependable performance dosing as little as 0.15 ml./hour up to 85 ml./hour per channel. Ideal for 2-part calcium/alkalinity addition. Also included is a higher-flow (3 - 800 ml./hour) one-channel tubing set. Can easily be used for makeup/ kalkwasser dosing, 2-component dosing. Two-Channel Capability Built In, with digitally adjustable dosing rates from .15 mL. to 85 mL./hour per channel when used with the included 2-channel tubing set. Float Switch Compatibility. A Float switch is available as an accessory, and is plugged into the control jack in the back of the pump. The float switch is connected to transistor-level voltage, providing safety and dependability. Thus the pump can be set up to run only while the float switch is in the "down" position, preventing overflows and providing peace of mind. High Volume One Channel System. The Sentry can also be used as a one-channel makeup water doser. Using the included high volume tubing set, the Sentry will pump up to 850mL per hour, or up to 5 gallons per day. Timer/Controller Interface - Using the optional Timer/Controller Interface, the Sentry can easily be controlled by other devices, such as pH controllers, electronic float switches or timers. For the operator’s manual for the Sentry as a .pdf, go here. Water-resistant construction, with an interlocking housing and flat panel membrane switches for safety, moisture resistance and easy cleaning. The Sentry will utilize liquid from containers 3 feet below pump and will pump vertically at least 15 ft. Compact - measures only 6'" long x 5" deep. (The same size as two playing cards side-by-side), and 7" high. Uses less than 5 watts of electricity. Purchase of the Sentry includes single-channel 850 mL/hour tubing set as well as the 0.15 – 85 mL/hour 2-channel dosing system. Exceptional Accuracy and Tubing Life Utilizing a heavy-duty, Swiss-made motor and precision gear drive system, The Sentry pumps at a constant rotor speed of 12 rpm when set at 300. For slower rates, the timing cycle is changed but the rotor speed remains constant. Since it doesn't rely on friction to drive the pumping mechanism, the output of the pump will remain stable over very long periods of time. Also, since the rotor moves at such a slow speed, tubing life is significantly better than that of higher-speed, gearless pumping systems. Built-In Battery Backup - The built-in nickel cadmium battery pack will power the pump for over an hour, providing peace of mind during power outages or in moving the equipment. The settings not only stay in memory, but the pump will actually run on the battery for over an hour. When turned off, the memory of the last rate setting remains in the pump electronics for 24 hours, so when turned back on, it rapidly returns to the previous setting. Precision Gear Drive - Internally the Swiss-made motor and gearbox power the rotor at 12 RPM, providing 24/7 operational capability as well as consistent dosing rates. Bright LED Display- Easily visible from a distance or underneath darkened cabinets. Quiet Operation- This pump runs exceptionally quietly, making less noise than most desktop computers. 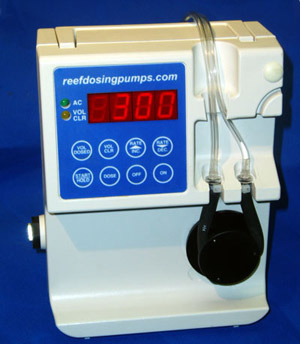 Fixed-Dose Capability- Easily set a fixed volume to be dosed using the "dose" control button, providing a simple way to administer medications or other one-time additions of materials, or to acclimate livestock by adding a fixed volume of aquarium water. Guarantee- The Sentry is guaranteed against mechanical or electronic defects for one year, both parts and labor. Damage by moisture or customer abuse of the equipment is not covered.